That’s right, honey! After a 10 year hiatus, audiences are thrilled that the multiple Primetime Emmy Award-winning original series “Will & Grace” is back and “just as incredible as the original series – hilarious, poignant, and contemporary” (Entertainment Weekly). As Eric McCormack, Debra Messing, Sean Hayes, and Megan Mullally reprise their acclaimed roles as Will, Grace, Jack and Karen, the new season picks back up right where it left off – best friends navigating life together once again. A decade after their unforgettable eight-season run, comedy’s most fabulous foursome is back in “Will & Grace (The Revival): Season One” and joined by outstanding guest-stars Bobby Cannavale, Harry Connick Jr., Jennifer Lopez, Alec Baldwin, Minnie Driver and many more. The legendary James Burrows, director of the original “Will & Grace” series, returns along with a slew of razor-sharp jabs and dirty martinis. “Will & Grace” is from Universal Television in association with KoMut Entertainment and Three Princesses and a P.
.Back to the Beginning – The cast and crew discuss what made “Will & Grace” so special and the relevance it continues to have in society today. 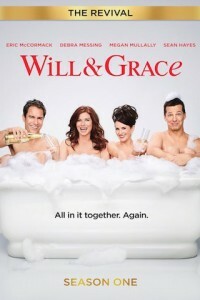 .Reuniting the Team – What started as a PSA, turned viral and sparked the revival of a new era of “Will & Grace”. .Classic Comedy – Series Director, Jimmy Burrows, and the cast on creating the funny and keeping the laughter going.